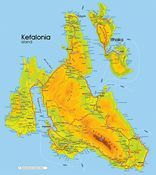 In 1865, a year after the granting of the Ionian Islands from the British in Greece, established the Prefecture of Kefallonia, consisting of three provinces. In 1952 Ithaca finally returned to the prefecture and the provinces became four. ( Ithaca, Kranea, Pali and Sami). In 1997 with the project "Kapodistrias", it was created administrative reconstruction, so the prefecture of Kefalonia or Kefallinia divided into 8 municipalities and Community of Omala. From 1st January 2011, the entire island of Kefalonia is a single municipality, which came from the combination of seven (7) municipalities and one (1) community. The municipality of Ithaca is a separate, which administratively belongs to the prefecture of Kefalonia with a population of 3.180 inhabitants. With an area of 904 sq km2 and a permanent population of 38.770, the municipality of Kefalonia is the fourth largest municipality of the country. Kefalonia is eminently a mountainous island, with large vertical partition. The largest Mount of the island is Ainos ( with its peak the Megalo Soro, 1828m., the highest in the Ionian Islands) which lies in the southwestern part of the island with NW- SE address. The east side is full of fir of species: Abies Cephalonica, and there is great shrubby vegetation. The extensions of Ainos intersect the backbone of the island. On the island there are two peninsulas, in northern that of Eriso (mountain for the most part),and west of it, Paliki (plain and the most fertile in the island). The island has limited marine division. In the northeastern part the bays of Sami and Antisami, in northwestern ,the Gulf Of Argostoli (one of the most safest in the Mediterranean) and the southern bay of Lourdas. The shores are rocky, especially on the west side are steeper and difficult accessible. The prefecture of Kefalonia has a temperate climate, mild winters and summers. In some inland areas of the island temperature has been 40o C or higher. During the winter, frost is rare, though not extensively. There has never been total frost. The autumn is a temperature greater than the spring, and this is because of the high frequency of booms and hot winds at that time. At 15,6o C, the thermometer reaches its annual range, with coldest month in January and hottest in August. The humidity is high especially during the cold season (over 70% from October to May), due to fluids southern winds which prevail this period. In the prefecture of Kefalonia there is relatively little overcast (3.5 scale 0 - 10) . The south winds are frequent especially during the cold season, thus rainfalls are several. Although rainfall is 900 mm both at lowland and coastal areas, however, in areas of northeastern Kefalonia rarely rains. Snow is rare, but we meet more frequently hail, mostly in December and January and throughout the summer.